AV for You set up Audio, Video, Lighting and Staging rental equipment for an event held by Lyman Companies at Sheraton West in Minnetonka, MN. 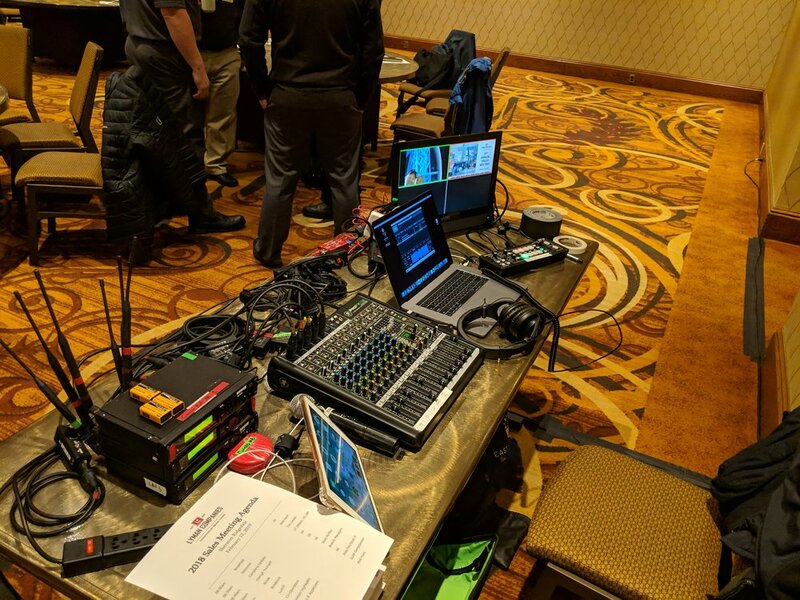 For audio rental equipment we used our Shure Wireless Microphones, Mackie ProFX 12 Mixer, and RapcoHorizon Laptop Audio Interfaces for control over handheld, lavaliers, and laptop audio. For video rental equipment we front projected NEC 3K HD projectors onto our Draper 5.75' x 10' screens. We used our Decimator HDMI-SDI converters to distribute HD Video Signal to the projectors from a laptop at the podium. We also used our Roland V-1HD Video Switcher to accomplish simple switching between PowerPoint and Video Playback. For lighting rental equipment we set up five of our Eternal Lighting Cube Echo LED Battery Powered Uplights. For staging rental equipment we set up five panels of pipe and drape for a backdrop using our Rose Brand black drape.